The parking lot at the trailhead is on the west side of Kanan-Dume Road 1.8 miles south of Mulholland Highway. Look for the trail on the Zuma Canyon side. 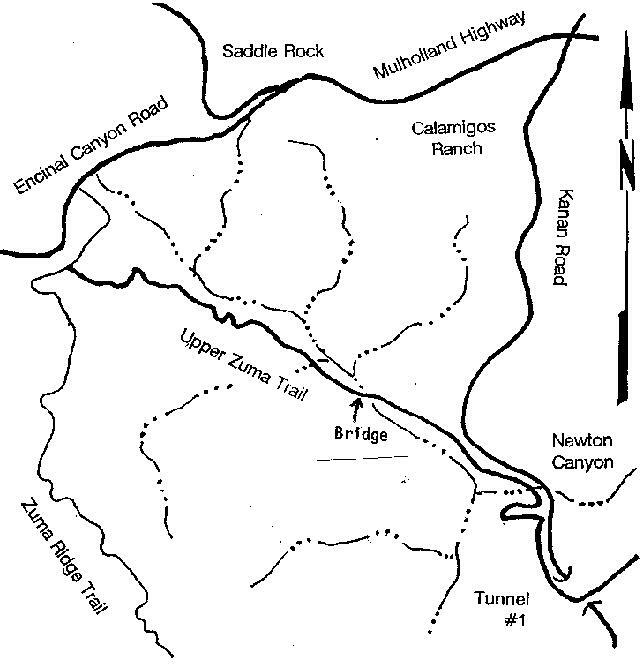 Zuma Canyon is a rugged channel cut into the mountains from Encinal Canyon Road to Zuma Beach. Trails accessing remote areas are almost non-existent. A dirt road along Zuma Ridge gives us great views of the canyon below, and the lone steep and winding trail drops to the stream then climbs 1200' to the east ridge. When power lines were brought across the mountains access roads were constructed -- but this was a long time ago and now the roads are trails for the most part. 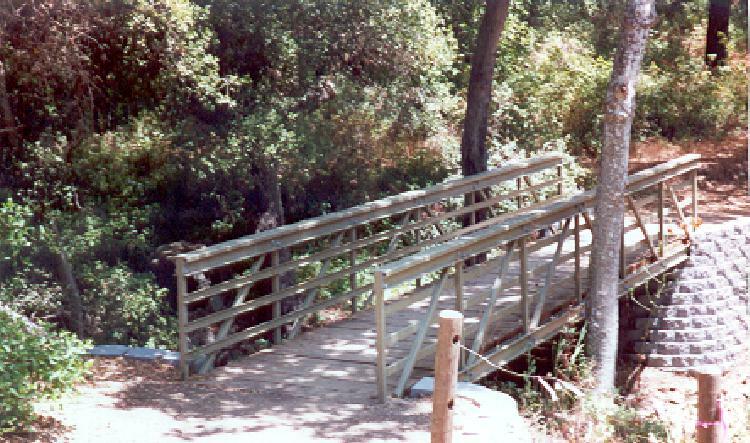 We will cross Zuma Canyon on a recently built trail in a less dramatic area, but will still see two great waterfalls, and some of the most colorful flowers in the mountains. We leave a flat sunlit parking lot and contour along a steep north-facing hillside. As we lose altitude trees give shade and a feeling of seclusion surrounds us. A switchback right brings us closer to Newton Canyon stream. Look for Virgin's Bower and Humboldt Lilies -- a transformation to this natural setting happens quickly. After crossing Newton Stream we take a side trip to the top of Upper Newton Waterfall. Across from our viewing point we can see an evergreen shrub -- California Barberry. We are not likely to see Barberry plants anywhere else in the Santa Monica Mountains. Look for bright yellow flowers in racemes during mid spring. 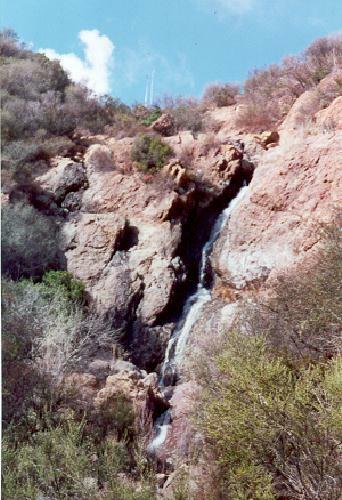 It is possible to get to the bottom of the falls by continuing along the trail, finding a steep trail on the left to get to the stream. Two more falls are downstream; a 9' middle drop and a 50' lower falls. No trail leads to either. Back on the trail we hike through a chaparral forest mostly of Ceanothus. We are well above Zuma Creek and will not see Big Zuma Waterfall. But we soon close in on the stream and cross over on a bridge. From the bridge our hike is uphill all the way with a few dips when we come to side ravines. Along one part of the trail coming out of a ravine we make a left turn and look upstream at Upper Zuma Waterfall. Springtime after a good rain is the best time, but even in summer a trickle of water comes down. Our trail ends at the north-south trending Zuma Ridge Trail, a major trail connecting the Backbone Trail to the Pacific Coast side of the mountains. We turn around and return to Kanan-Dume Road, or if this is a car shuttle we turn right on the Zuma Ridge Trail and in 10 minutes we'll be at our cars. In time a continuation of the Back-bone Trail will go into Trancas Canyon.